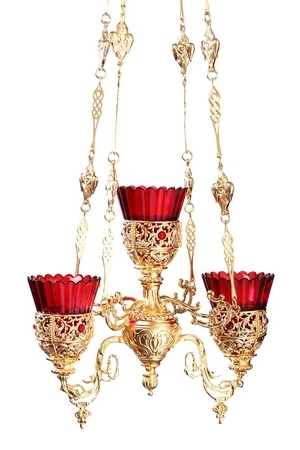 Three-light vigil lamp - Istok Church Supplies Corp. Traditional Orthodox hanging oil vigil lamp. Brass, casting, gold-gilding. Size: 9.8''x11.8'' (25x30 cm). Chain length: 17.7 (45 cm).